Velo Orange sent me a bolt to replace the one I broke in my attempts to install the VO Fluted Fenders I bought from them (free of charge, at that). I installed the rear fender and rack the other day, but hadn’t had a chance to do a test ride. So last night I set out to do just that. Unfortunately, I didn’t get far before I hit trouble. In my attempt to shift to the smallest gear on the cassette, the chain got stuck. 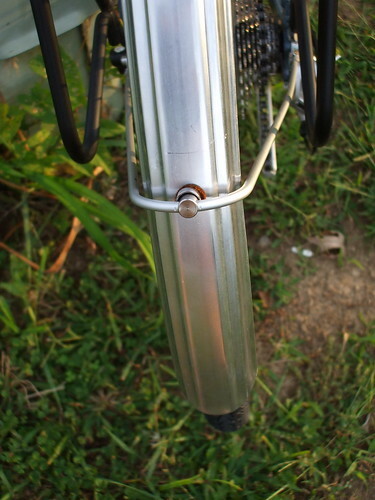 I thought it had overshot the cassette and gotten wedged between the cassette and frame. I fixed it and started riding again. I tried shifting to that gear again, and the same thing happened. At this point I realized that the bolt I used to attach the fender was too long, and the chain was catching on the bolt. I hadn’t gone far so I just rode home to fix it. I didn’t have a shorter bolt, so instead I put a nut on the bolt before screwing it in. The nut acts as a spacer. This worked perfectly, and I decided not to shorten my ride plans. I did, however, grab an extra light on my way out the door. This later proved to be a wise move. The ride that followed was truly fantastic. Picture this: you set out riding from your front door. Within a couple of miles, you find yourself in the middle of nowhere and stop for a moment to check on your fenders and make sure nothing’s coming loose. You follow the road through many twists and turns and reach a long, steep descent. You pick up more and more speed, the wind making your eyes water as you hit 42 mph. You squint to see and hit the brakes so you won’t take the turn too fast. Your bike feels incredibly solid through all this, never once out of control. 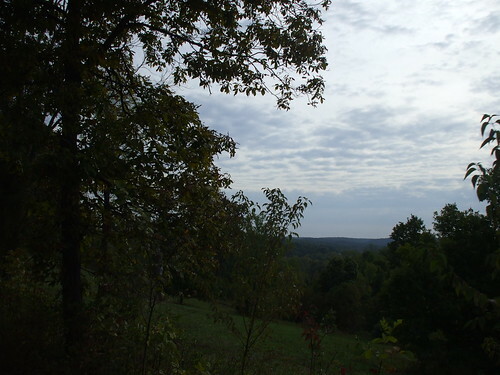 You ride along the valley for a few minutes, then tackle a big climb. After some more twists and turns you find yourself back at the highway. 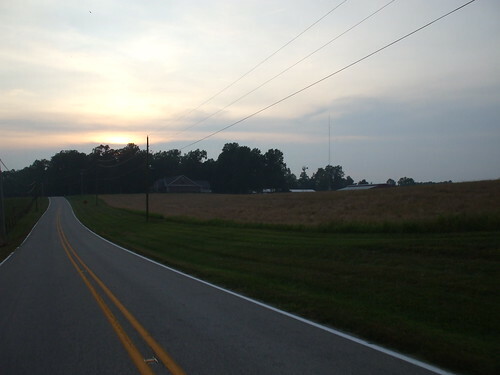 You turn to ride further from town and turn on your rear light so approaching motorists can see you. 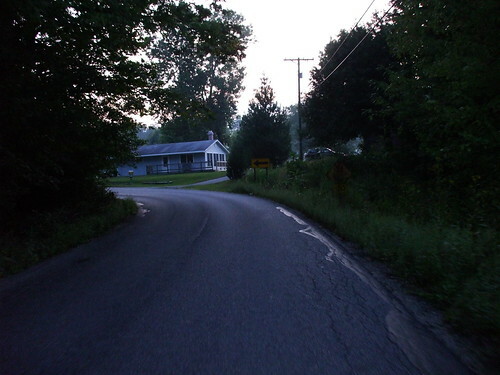 A deer runs into the road and you hear her hooves clicking on the pavement. She sees you coming and she and her friends freeze. Once you get too close for comfort, they bound gracefully into the woods. The next few miles are mostly downhill, with a few easy climbs and the road twists back and forth as you gradually descend. A couple of steeper hills let you pick up some speed and throw your weight into the turns. A bug flies up your nose and while you manage to get it out, whatever it was released some kind of smelly chemical in your nose. You hack and sneeze and attempt to get rid of the smell. Ultimately you give up and wait for it to go away on its own. You look behind you and see a beautiful sunset, the sun illuminating and adding pigment to the overcast sky. You forget about the bug pheromone up your nose for a moment. 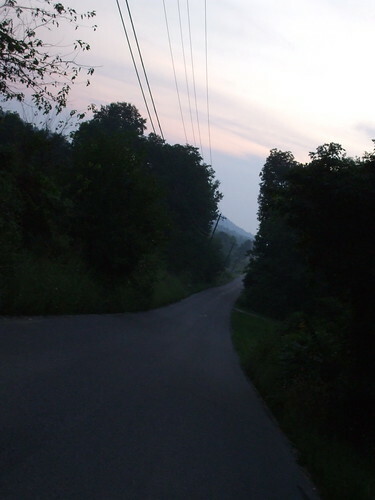 You turn onto a back road and are about to let loose down another hill when you see the valley where you are about to descend is filled with dense fog. You slam on the brakes, losing your momentum, but you simply must capture this sight. You turn your other lights on, it’s getting dark and you want to make sure you will be seen. Your eyes are adjusting to the darkness though and you have no trouble seeing the road, although visibility is limited with the fog. 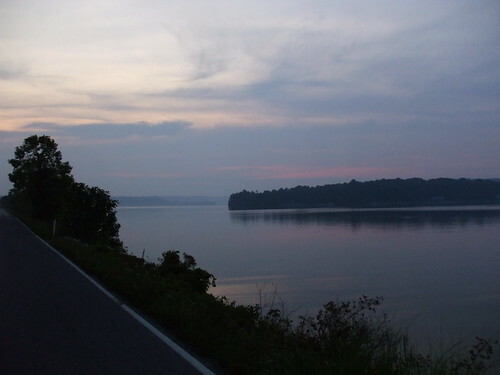 You get a glimpse of Lake Lemon and pull off the road to get a better look. A bird with a wingspan as long as you are tall takes flight and swoops into the distance while you stand there dumbfounded, temporarily having forgotten how to use your camera. The bird is gone but the lake itself looks beautiful and a broken dock adds a bit of mystery to the scene. You ride through more fog and while the temperature is dropping, you still feel very hot from the extreme humidity. 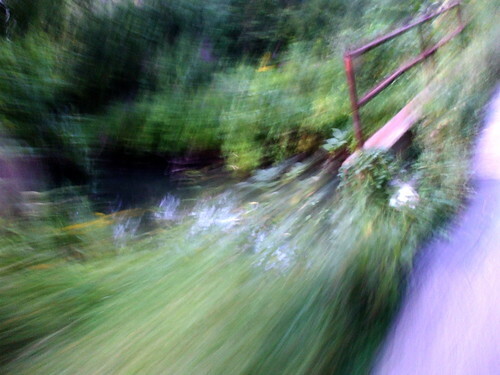 You cross a creek, but it’s a blur. 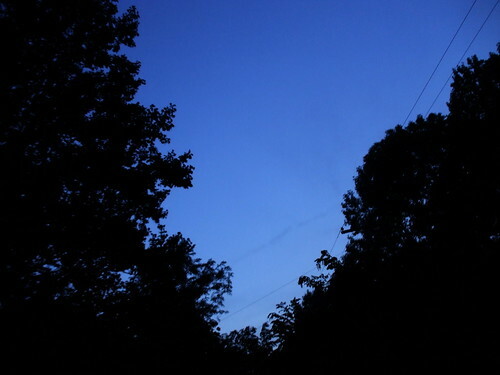 It’s dark, and you’re traveling at a pretty good clip. 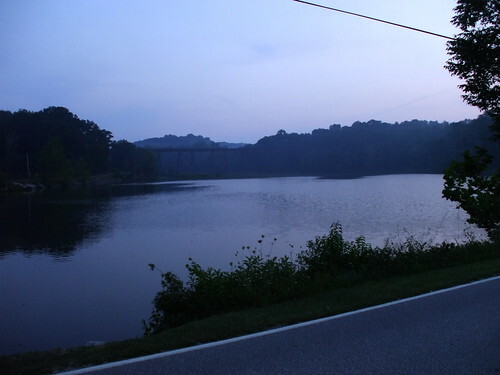 You come around a bend and Lake Lemon opens up before you on both sides. You ride across, and marvel at the fact that while you’ve seen this lake dozens of times, it’s never looked quite like this. 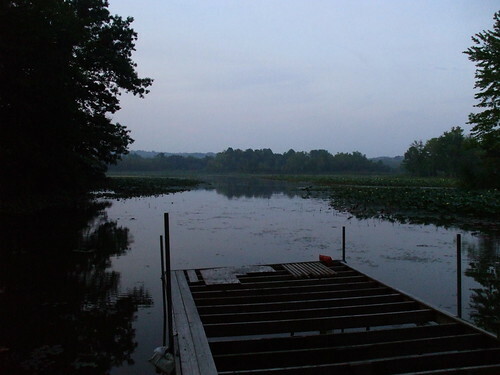 You linger at the other end of the lake to take it all in for a little longer. You begin the long climb out of the valley, and attempt to race the fog. You climb above the fog line and look back, seeing the fog beneath you. As you ride on, the fog catches up with you and envelopes you again. 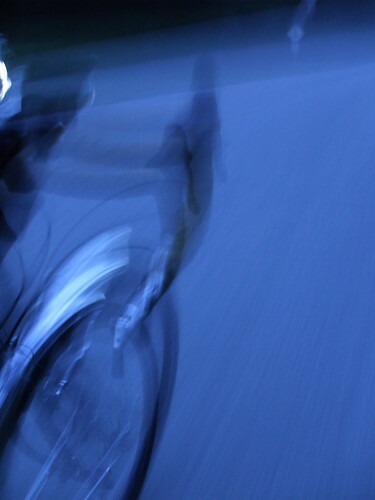 For a while you still think about trying to make it home before it gets too dark, but you realize it’s already pretty much there, and furthermore, you are enjoying riding in the dark. You wonder why you don’t do this more often. You switch one headlight from blink to solid mode to help you see. A few cars go by but there is plenty of room for them to pass. 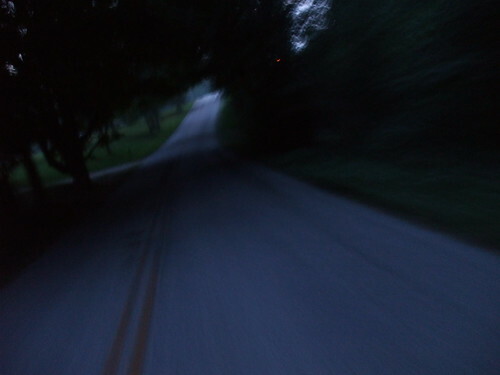 The roads are quieter at night. You reach the highway again and realize you still have a good 20 minutes or more of riding ahead of you. But there aren’t many cars and they all give you a wide berth. 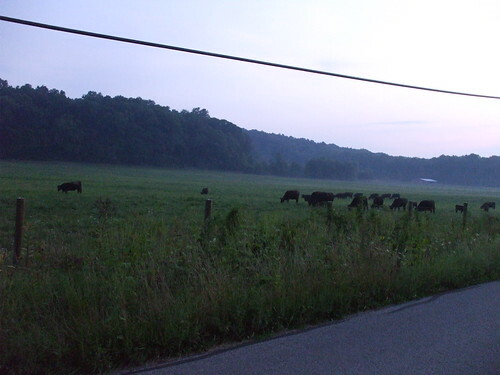 You savor the experience and see a few more deer on your way home. You arrive at home, tired, but content. 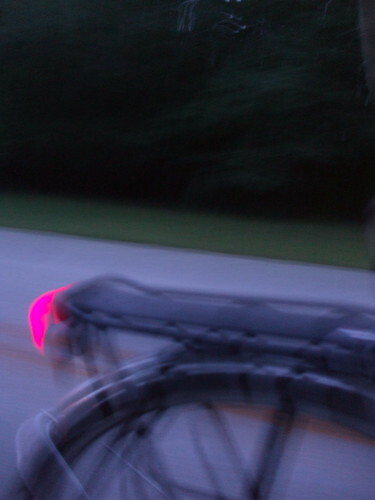 You vow to do more night rides (and next time mount that better light on your bike). I posted my Giant OCR2 on Craigslist just after midnight on Tuesday. As in, it had just transitioned from Monday to Tuesday. Today, I sold it, for the asking price + some extra for the clipless pedals which I had planned on keeping. The guy who bought it was very enthusiastic about the bike, and getting into some serious riding. I’m confident it went to a good home, and now I have some extra money in the bank. I’m amazed that I sold it so quickly and easily. Unfortunately, most of the money will go to pay for x-rays and physical therapy for my finger. Easy come, easy go. Last night I decided to take my road bike, a Giant OCR2, for one last ride. I decided to sell it but wanted to get to ride it once more, and make sure I really, truly was ready to sell it. I hadn’t ridden it since I got the Long Haul Trucker. The bike performed admirably, it’s noticeably faster and lighter than the Trucker. 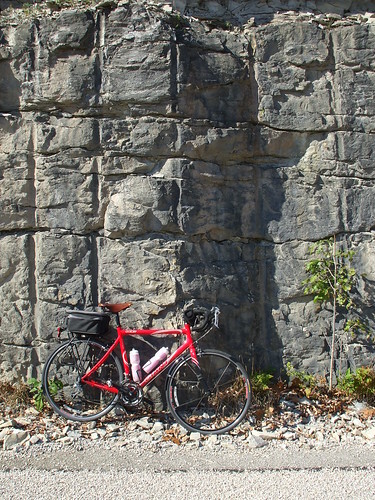 Out-of-the-saddle climbing is much more effective, and you can feel a more direct transfer of power from your legs to the pavement. I enjoyed riding a faster bike after riding the Trucker for a while. I rode the Water Works route, which is probably the route I’ve ridden the most on that bike, and it felt great. 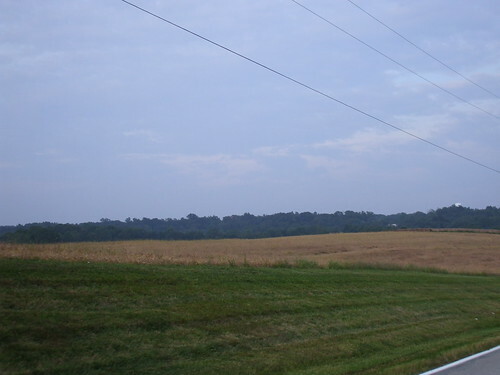 The route has a lot of rolling hills, and I had fun hammering over long lines of rollers. 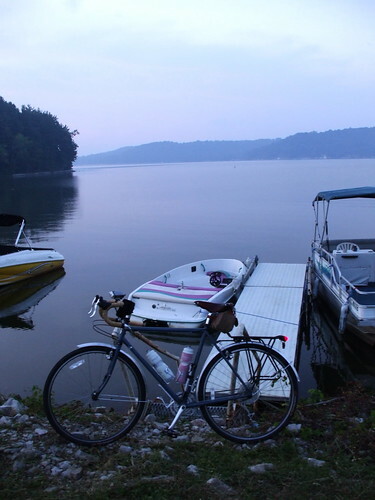 As I rode, I thought about all the places this bicycle has taken me. This is the bike that really got me hooked on road riding. I got it just at the beginning of last year and have put over 4,000 miles on it in that time. 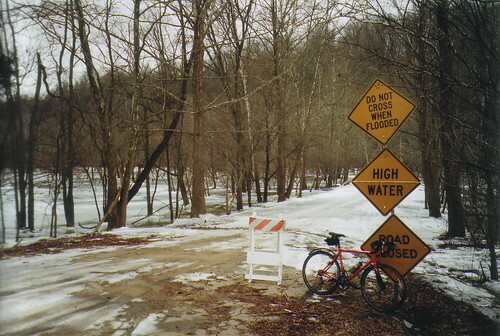 I remembered one of my first rides taking me down Moore’s Creek Road, where I came flying around a corner to find the road before me covered in ice. And how that ride of 13 miles or so left me feeling drained. Now, that’s a short ride. 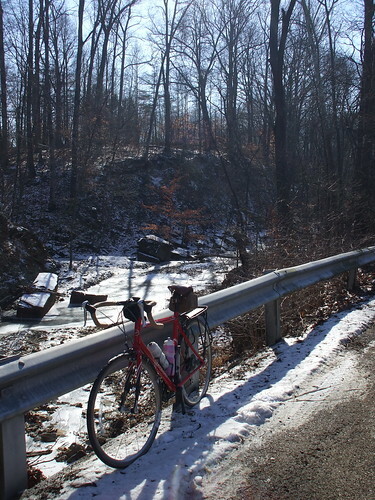 My bicycle by an iced-over Moore’s Creek Road. 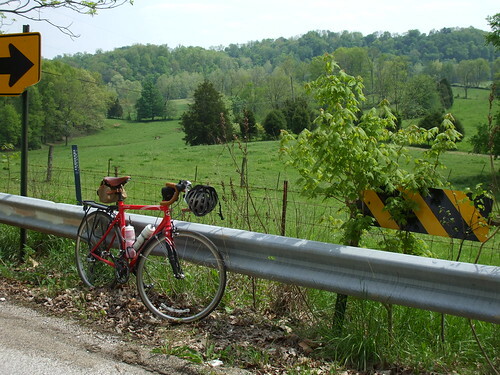 I thought about riding the Hilly Hundred on this bicycle last year. Two days, 100 miles and over 6,000 feet of climbing. I thought about riding the Nashville 90 last year. 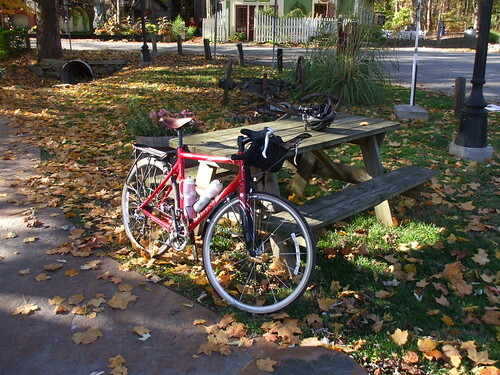 90 miles of riding on a beautiful fall day. I thought about various winter rides. 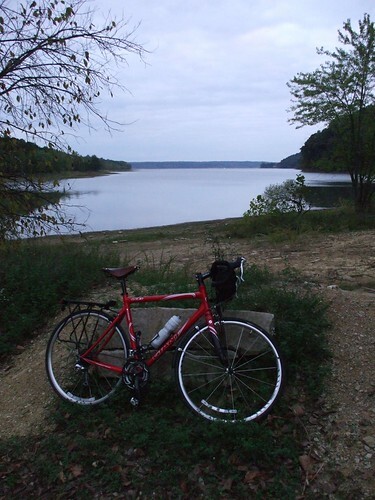 I thought of the numerous Mount Gilead, Water Works, Shilo, Monrgan-Monroe State Forest rides, and rides around Lake Monroe and Lake Lemon. I’ve done each of these routes many times on this bicycle. I thought about cracking a rim on Dr. T’s Funky Fifty and then upgrading my wheels. 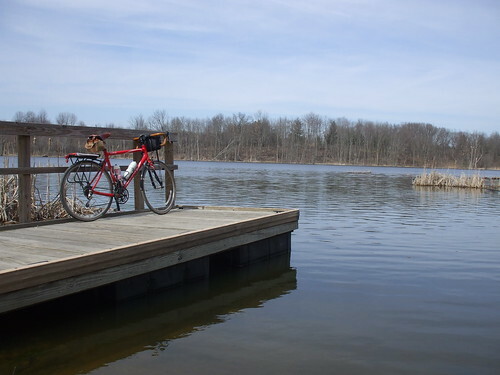 I remembered the gruelling ride from Fort Wayne to Chain’o’Lakes State Park. 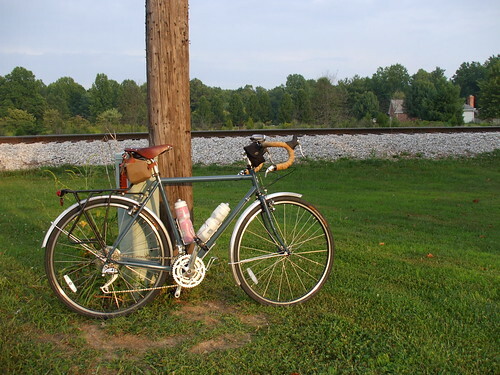 I thought about my first S24O, which I did on this bike. One thing is for certain: I’ll miss this bike. It’s served me very well. However, I also realized that everything I can do on this bike, I can do on the Long Haul Trucker, and then some. The only advantages of this bike over the Trucker are that it’s faster and lighter, and those were never its strenghts to begin with. The only thing I can do with this bike that I can’t do with the Trucker is hammer up hills. I can’t justify keeping it just for that. 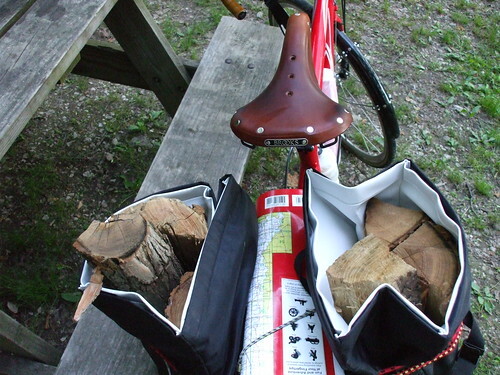 I guess it’d be better for club rides, but in practice, I never do those. The biggest question was: could I see myself reaching for this bicycle when I have the Trucker right there? The answer was simply “no.” It’s time to move on. So, I posted the bike on Craigslist. I wasn’t reluctant, but it was a little sad. It’s weird how attached we can get to our bikes, even when we know we have something better. I already have a potential buyer. We’ll see if that works out. If not, I’m confident I can sell this bicycle, as it’s a great one. If it takes a while, I can always go for “one last ride” once more.